The core fundamental of any association is UNITY – one of many challenges that the Pest Control Association of Malaysia (PCAM) is yet to resolve. 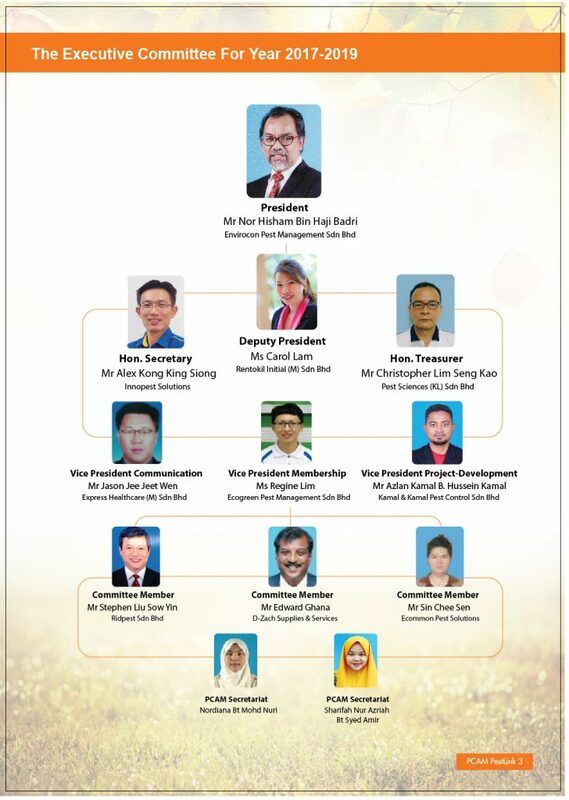 The newly elected Executive Committee (Exco) members team and I will work harder to ensure that we will achieve this common objective since we are able to work in the esprit de corp. The current Exco are experienced and enthusiastic individuals who will work continuously and tirelessly together in reaching these objectives. The team will continue to uphold one of the PCAM key objectives that is to foster a closer and more engaging relationship among the industry players. We are also planning an outreach program to have dialog with the respective regulatory bodies and government agencies. This knowledge sharing activity is to impart to these end users the standard and right practice of pest control. We hope that the close ties with these stakeholders will eventually lead the industry to the next level that has long been desired – high degree of standard and professionalism. The key aspect to achieving high standard is through investing in quality human capital. Being in the service oriented industry, it is ‘people servicing people’ business model. Thus, it is necessary for us to invest in our employees by having them trained to be competent pest control technician who are expert in their field. These equalification are sought by the employer and end user alike. If not, we will continue to be trapped in time in a vicious cycle of price war. Our service staff who is enterprising enough may be an entrepreneur himself one day. But if he is competent, he would agree that price is not the only determinant factor to land a contract. The PCAM will team up with the Human Resources Development Funds (HRDF) to ensure the PCAM members will enjoy the non-technical courses at a very competitive rate – good news to pest managers who contributes to the HRDF under the Pembangunan Sumber Manusia Berhad Act 2001 [Act 612]. Nonetheless, the team and I would like to express our appreciation to the members, associates, academicians and agencies that have subscribed to the PCAM’s vision and mission. Please continue to contribute in any way possible. Our thanks and appreciation also to the past Exco members who have taken initiatives, efforts and personal times for the well-being of our beloved association. While we have set some objectives, we would appreciate and welcome your proposal to further improve the quality of our Association. In the meantime, feel free to contact us should you have any enquiry and ideas.